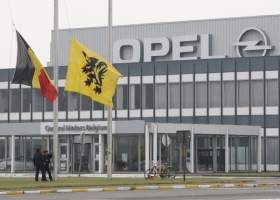 The Belgian and Flemish flags flew at half mast at Opel's Antwerp plant on Friday. MUNICH -- Workers at General Motors Co.'s European unit Opel will stage a mass protest next week over the planned closure of the carmaker's Antwerp factory in Belgium. GM has said it will shutter the plant, one of four factories in Europe which build the best-selling Astra model, as part of its proposals to cut its European capacity by a fifth. Opel unions claim GM has gone back on a pledge to build a small SUV in Antwerp to replace Astra production that is being transferred to other Opel plants. GM now plans to build the SUV, which will be sold under the Opel and Chevrolet brands, at its Daewoo unit in Korea. Germany's powerful metalworkers' union IG Metall on Friday described the Antwerp factory closure "as a declaration of war against all Opel's European workers." Workers from Opel and British sister brand Vauxhall plan to gather outside the Belgian factory on Tuesday, January 26, to stage a protest. The closure of Antwerp, which employs 2,600, is the first step in GM's plan to restructure money-losing Opel to bring the unit back into profitability. On Thursday, Opel CEO Nick Reilly said GM will cut up to 8,300 of the carmaker's 48,000 workforce in Europe, including about 4,000 jobs in Germany. Reilly said the Antwerp plant had to go because the company needs to shed 20 percent of its manufacturing capacity due to falling new-car sales. Opel expects the western European car market to be 1.5 million vehicles below the 13.6 million units sold in 2009 and almost 4 million below the market's peak in 2007. Opel/Vauxhall sales in Europe fell 7.8 percent to 1.06 million last year with its market share dropping to 6.7 percent from 8.7 percent, according to ACEA, the European automakers' association. Reilly said GM is still in talks with several European governments including Germany about 2.7 billion euros ($3.8 billion) in state subsidies it wants as part of its 3.3 billion restructuring plan for Opel. GM gave 650 million euros to Opel earlier this month January. It said it advanced cash for engineering work it otherwise would have paid Opel in April and July.